Update: Comments are once again being accepted on a planning application to build homes on agricultural land North of the A26 adjacent to Goldsmiths Recreation Ground. In recent years the fair, which comes to town to coincide with the carnival, has used part of the site. Following comments by Historic England about the proximity of the development to the Grade II listed Luxford Farmhouse a revised site layout was submitted by the developers. The application proposal now states it is for 119 dwellings not 139 on the application form. The site will be accessed via a T-junction off the A26. Further consultation has also take place with East Sussex Highways and they have no objections to the scheme. The public now have until the 12th October to respond. 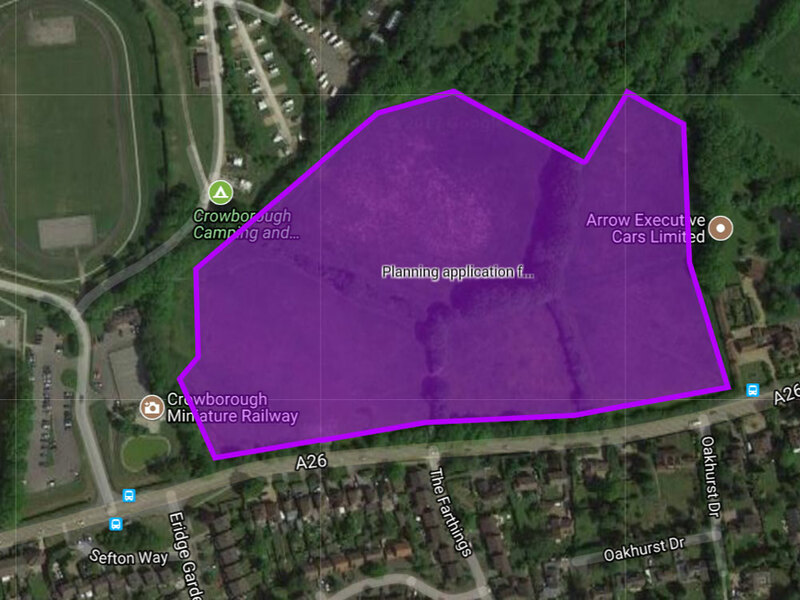 Original article (Oct 2017): Fairfax Acquisitions Limited have applied for outline planning permission to build up to 139 homes on land North of the A26 adjacent to Goldsmiths Recreation Ground. The application to Wealden District Council follows a public consultation event held at Crowborough Community Centre on 5th September. The homes will be a mixture of market and affordable housing. As required by Council Policy 35% will be affordable homes (flats for Affordable & Social Rent and nine 3-bed houses Shared Ownership). The 6.5 acre site is within the High Weald Area of Outstanding Natural Beauty. The fields are currently owned by Mr JR and Mr RH Seymour. Members of the public have until 10th November to submit comments. Click on the following link to full the application (Ref: WD/2017/2197/MAO): www.planning.wealden.gov.uk.